NEW-YORK, July 27. /TASS/. 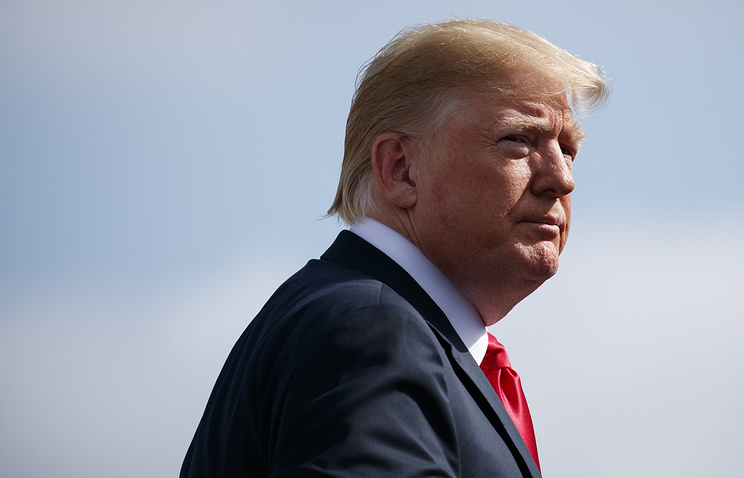 During Wednesday’s negotiations with European Commission President Jean-Claude Juncker, US President Donald Trump proposed scrapping licenses on liquefied natural gas shipped from the US to Europe. The parties have agreed to negotiate special license exemptions in the future, the Wall Street Journal daily reported on Thursday. The daily cited several EU officials, who accompanied Juncker to Washington. According to the sources, during the talks, the parties discussed increasing the supply of US liquefied natural gas to Europe. The daily reports that the EU leaders had agreed to this move back in May, even though US gas is as much as 20% more expensive than Russian gas delivered to the EU. In Washington, the EU representatives reminded Trump that US companies need licenses to sell overseas, which inflates prices. According to the newspaper’s sources, Trump proposed scrapping these licenses altogether, however, his aides were categorically against such an idea, stating that licenses are vital for US national security. As a result, the parties agreed to negotiate exemptions for the license regime for certain US companies. The daily reported on several interesting details that took place during the negotiations in Washington. After almost three hours of talks, Trump said he wanted to hold a joint press conference with Juncker to announce the good news. US Trade Representative Robert Lighthizer and Treasury Secretary Steven Mnuchin disappeared for more than half an hour in a room to work on a joint statement. No one expected any agreements to be made during the negotiations, so a press conference announcement came as a surprise. White House officials had to work quickly to set up the podiums, while journalists were called to the event with little warning, the article reports. According to Wall Street Journal, the key elements of the agreements reflect the offers developed by EU officials two months ago in hopes that Trump would not introduce tariffs on steel and aluminum import from the EU. The US introduced the tariffs on June 1. The daily reports that on the whole, Trump ditched his argumentative approach, which he used during the G7 and NATO summits; instead, he was "charming, well-briefed" and "made an effort" to reach a deal. During the talks, Juncker used several cue cards with several issues explained in a simplified manner. He let Trump know his stance on the tariffs war rather bluntly. "If you want to be stupid, I can be stupid, as well," the European Commission president said. On July 25, European Commission President Jean-Claude Juncker and US President Donald Trump held talks, on the outcomes of which Juncker said that the EU coincides with the US on several issues, and that a lot needs to be changed in their trade relations. In particular, the EU official stated that they had agreed not to introduce new tariffs, while the negotiations are still underway. It was reported on Wednesday that the US and the EU had agreed to start working on eliminating duties and trade barriers, and to create a working group for resolving issues in the sphere of trade and for evaluating the existing tariffs. The EU agreed to increase import of US liquefied natural gas and agricultural produce.